This cake box is also widley used as a normal bomboniere or favor box and can be filled with our yummy chocolate hearts or our sugar coated almonds. It is tradition that only a small piece of the wedding cake is given. With one cake for 50, 100, 200 or more guests, the slices can't be too big. 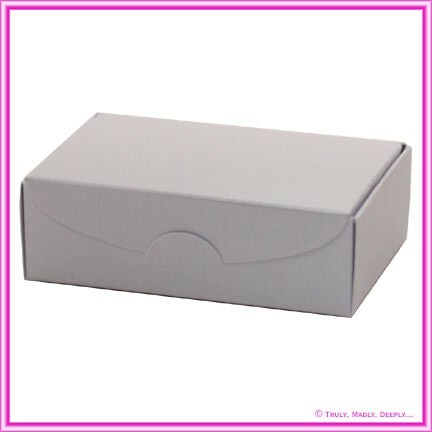 This box measures in perfectly at just 9.3cm wide, 5.7cm deep and 2.78cm tall. For those with a spare or larger cake wanting to give larger slices, we also sell Cake Bags. We recommend lining this box with baking paper or similar, as coloured papers are generally not approved for direct food contact. 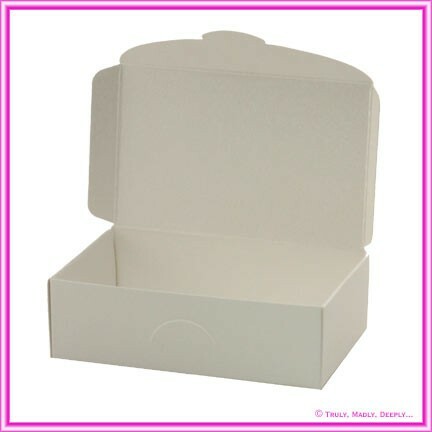 If you want to put your cake directly in the box with no wapping or lining, we recommend you choose food contact approved boxes like Buffalo Kraft, Crystal Perle Diamond White, Metallic Pearl White or Semi-Gloss White. This paper is also known by some as Metallic Antique Lustre. Best selling premium metallic paper best described as a cross between a latte and a silver with a lovely silver shimmer - double sided colour. The box measures 9.3cm x 5.7cm x 2.78cm and arrives flat packed for easily assembly - no glues required, just simple folding! This paper is manufactured by Arjowiggins Creative Papers in the UK and converted and packaged in Sydney, Australia. This is one of the very few metallic paper ranges suitable for inkjet, bubblejet and laser printers*. As a result it is the most widely used paper range for DIY wedding invitations and projects as most household and standard office printers that accept heavy weight card stock will produce beautiful results. 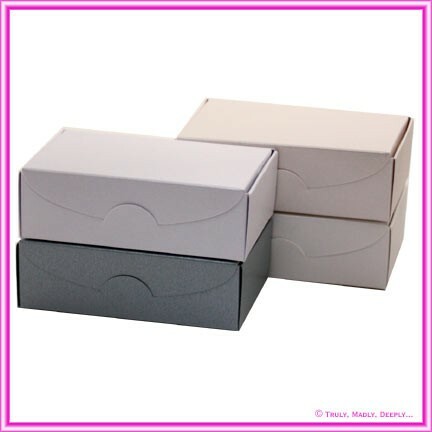 Other box sizes such as 5cm cubes, 3 Chocolate boxes, Purse boxes & chair boxes are also available. We also carry this colour in 120gsm paper weight, envelopes and a wide range of die cut DIY invitation cards. This is Genuine Curious Metallics stock from the UK - not a cheap Chinese copy. Hi Maria, You are a SUPERSTAR!! !